Fed up with big business dominating football? 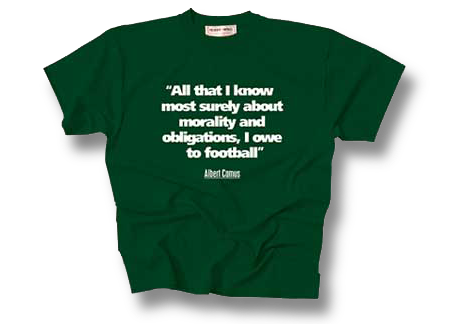 Philosophy Football FC is looking for new players including Albert Camus to line up in goal behind a back four of Jean-Paul Sartre, Søren Kierkegaard, Antonio Gramsci and William Morris. Knowledge of existentialism and ability to deal with inswinging corners a distinct advantage. If you play to a good standard, share the ethics of fair play and internationalism and can turn out regularly for Sunday matches in London and occasionally for European tours, please contact the manager, Geoff Andrews. Click here to contact Geoff Andrews for more details.